Yale will match the tax savings or choose a 10% credit for lighting, plumbing, or vacuum purchases. SPECIAL STORE HOURS AUGUST 8-12. Valid on bosch, whirlpool, maytag, kitchenaid, samsung, speed queen, and lg. EXCLUSIONS APPLY. CALL or visit STORE FOR DETAILS. Two months ago, Governor Charlie Baker signed the Grand Bargain simultaneously satisfying the many different parties of the State. Labor received a $15 minimum wage and an enhanced paid Family and Medical Leave Act (FMLA). Business owners received the Tax Holiday as a permanent fixture in August beginning in 2019. "BOSTON (AP) — Massachusetts shoppers are a step closer to enjoying their first sales tax holiday in three years. Legislation signed earlier this month by Republican Gov. Charlie Baker would require an annual sales tax holiday beginning in 2019 but left open the question of whether one would be held this summer. Critics contend it merely shifts sales from other times during the year while costing the state as much as $20 million in tax revenue." Tax Holiday is a suspension of Massachusetts State sales tax for all items under $2,500. You can buy as many items under $2,500 as you want. You have to pay in full for every item. Any items exchanged after the holiday will be taxed at the normal 6.25%. You do not need to schedule delivery at the time of purchase. We will let you know if and when the Tax Holiday is approved, as well as any rule changes by updating this article. There is a good chance you will be saving state sales tax August 11-12th this year. 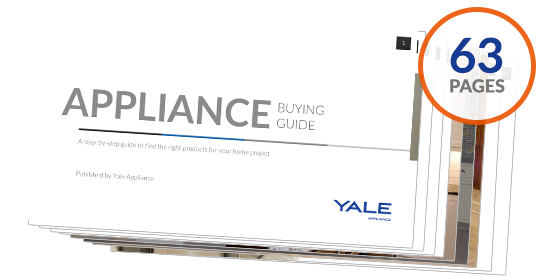 Download our Appliance Buying Guide with features, specs, buying strategies, and the answers to the top 10 appliance questions. Well over 350,000 people have read and trusted a Yale Guide. When is the Best Time to Buy Kitchen Appliances in Boston?